Pill burden is a large issue amongst patients that may require multiple medication treatments in order to manage a myriad of disease states. Taking this into consideration, it is acknowledged that patients with polypharmacy issues and large medication regimens may have trouble adhering to their scheduled medications throughout the day. Poor adherence may lead to patients having exacerbations of disease states, as well as demonstrating poor control of chronic diseases (e.g. HTN, DM). 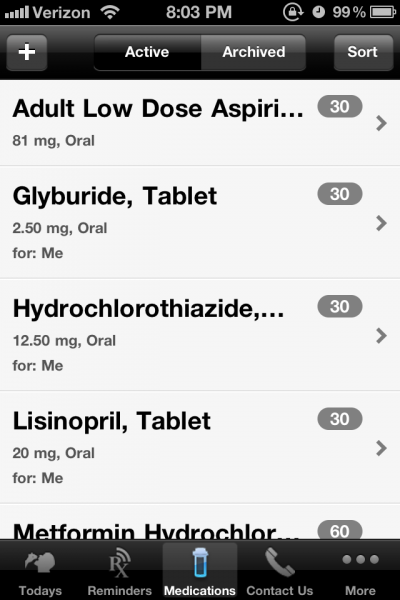 A previous app (Pillboxie) was reviewed by Dr. Nieder earlier, and noted several issues overall. However, Pillboxie was an interesting and well thought out app with potential utilization in practice. This review does not seek to do a direct comparison of both products, but will address similar concerns raised with previous medication reminder app reviews. RxmindMe is an app that seeks to help patients manage their multiple medications, as well as help serve as a reminder of when to take their medications. The developer of RxmindMe is RxmindMe, LLC. Unfortunately, at the time of this review their website was not accessible to garner more information on the organization. They also keep a Twitter feed (@RxmindMe) and Facebook page (RxmindMe), though both seem to have not been updated recently by the company. Their last update seems to have attempted to address issues with the iOS 5.1.1, which appear to have been addressed. 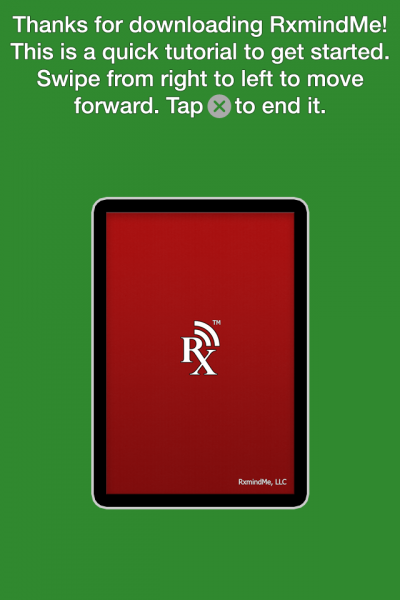 RxmindMe opens initially with an instructional screen showing the user how to utilize the app and the features that are provided. After viewing the instructional slides, the user is then greeted by a screen that shows several options at the bottom. These include: Todays, Reminders, Medications, Contact Us, and More. 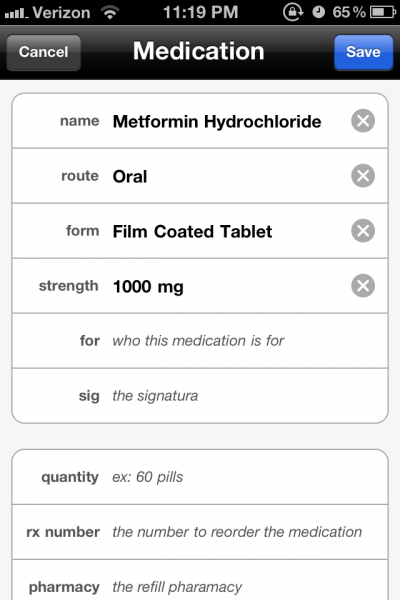 To start using the app, the user must first input all their current medications through the ‘medications’ option. Here, the user may then add their medications. This information includes: Name, Route, Strength, Sig, Quantity, Rx Number, Pharmacy, Doctor. It is also possible to set up a reorder alert based upon how many tablets you have calculated left. 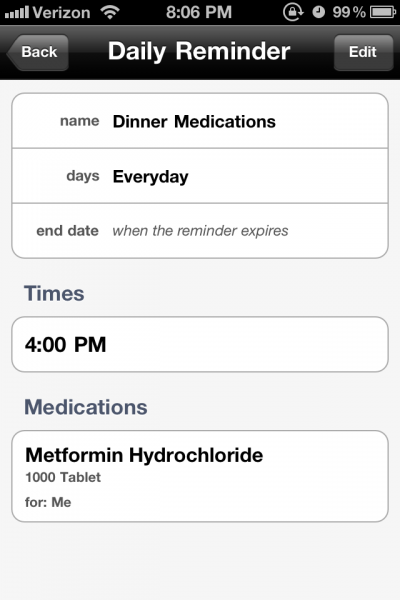 Adding medications is simple as the app also uses a registry to help identify medications. However, OTC and herbal supplements are lacking. In addition, some medications that I typed in (e.g. Xarelto, Gralise) did not appear. As such, this must be entered in manually. 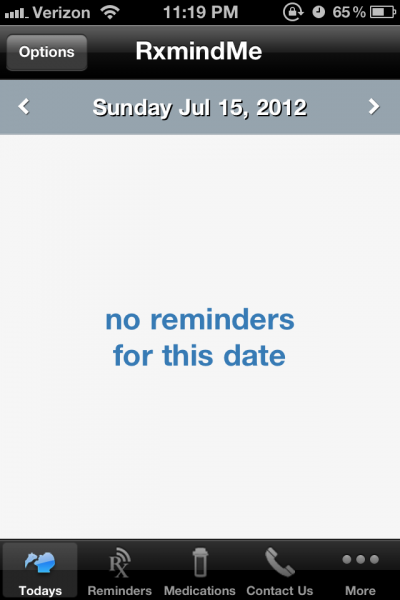 Next, the user then goes to the ‘Reminders’ option, where they can then schedule reminders. Reminders are scheduled based upon several dosing schemes pre-built, or the option to customize a patients own regimen. For instance, I scheduled for metformin 1000mg to have an alert on an hourly interval that coincided with morning and evening meals. 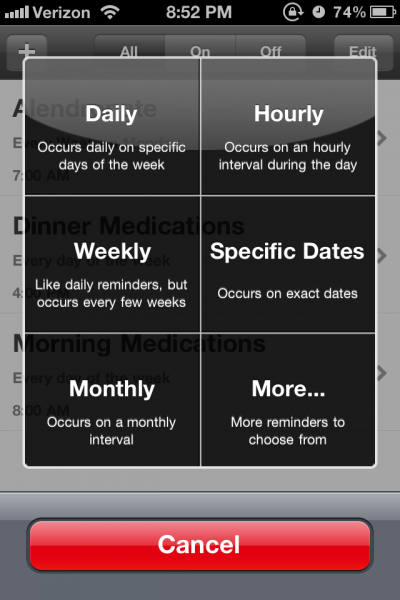 It is also possible to have a daily reminder than you can select several medications to be included at once (eg. glyburide, lisinopril). What’s even more terrifying is the app developers just left this app to dry in the App Store, without actually letting people know this in more of a public manner. @Craig – Thank you so much for informing me of this. It looks like Walgreen bought and registered RxmindMe in October 2011(http://www.trademarkia.com/rxmindme-85452861.html), about the time that that the support pages stop being active. I have not yet reviewed the Walgreen’s app to determine how much is similar or different, though quickly playing through it I noticed that when you add a medication, they incorporated their ‘Scan Rx Number’ and did away with the FDA list the RxmindMe app was utilizing. This may beneficial, and I will have to do a review of the Walgreen’s app and its pill reminder and determine what else is different and if its improved. I will tie that review back to this review as a comparison in the future. Again, I wanted to thank you for taking your time to supply this information. I take a medication and the dose may vary from one week to another and even then, the dose may be different between the different days I take it. The medication span may also vary. I feel that the apps I came across so far, are not designed for tracking such advanced patterns. Do you know by any chance a app capable of doing so?